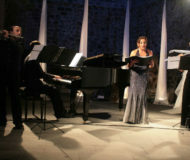 Will start Sunday June 17 till Saturday 21 July, in the fascinating setting of the Arsenal of the Republic of Amalfi, the series of concerts “On the trail of sirens” (Sulle tracce delle Sirene) where numerous artists will perform in concert with different themes. To open the event will be the writer Diego De Silva. The good music will be protagonist every week, Francesco Scelzo will play the guitar, between classic and modern sounds. The ensemble of harps and percussion: An Arperc will perform their new work “The Craft of the Wind” (Il Mestiere del Vento), a journey unique among the world’s different cultures. To host the event, in collaboration with the town of Amalfi, will be the Arsenal of the ancient Republic of Amalfi, which now is a Museum of the compass (bussola) and the Dukedom of Amalfi. The concerts will start at 9 pm and the entrance will be totally free.